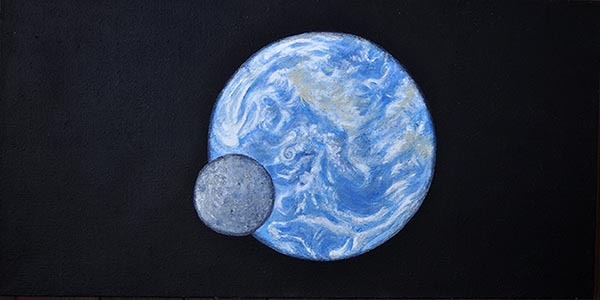 by Steven John Koeppe - Acrylic on Burlap, 20" x 40"
On July 16, 2015 a NASA camera aboard the Deep Space Climate Observatory (DSCOVR) satellite captured a unique view of the moon as it moved in front of the sunlit side of Earth last month. The series of test images show a fully illuminated "dark side" of the moon that is never visible from Earth. The moon is shown moving over the Pacific Ocean near North America. The North Pole is in the upper left corner of the image, reflecting the orbital tilt of Earth from the vantage point of the spacecraft. to view a view these inages on NASA's Website CLICK HERE.